"Planetary Patterns and High Focus Planets"
Lance Carter, was first introduced to astrology as a child and later became an astrologer on radio, newspapers and the internet. Lance previously published `Lightbody activation and Psychic Surgery'. The focus of this book is a detailed exploration of the meaning of the seven main planetary patterns in charts, originally outlined by Dr Marc Edmund Jones in 1941. In fact, the author corresponded and conversed with Dr. Jones, whilst doing his own astrological research. Section One, of this interesting book introduces the reader to Spherical Astrology and offers an overview of the main planetary patterns: the Splash, Bundle, Seesaw, Bowl, Bucket, Locomotive, Splay and Fan patterns. Lance also highlights the importance of `the cutting planet' and `the trailing planet' as well as the `high focus planets'. The remainder of this section outlines each pattern in detail, describing behavioral and emotional tendencies for individuals with each pattern. In Section two, the author's focus moves onto ways of recognizing the `High Focus Planet' in the chart, with interpretations for each of the planets when they are in this placement. Section three offers 100 example charts, outlining their planetary patterns with the final section of the book focusing in some detail on the nature of astrological aspects. This is a thorough book, which clearly explains each pattern in detail, as well as offering the reader simple, well designed diagrams to aid our understanding. It is likely to be of interest to all astrologers, although less experienced astrologers, are more likely to find the section on planets and aspects particularly helpful. In particular, this book reminds us of a very helpful visual way, a chart can be engaged with, at first glance. Planetary Patterns and High Focus Planets in Spherical Astrology by Lance Carter is an introduction to astrology's seven fundamental planetary patterns: Splash, Bundle, Seesaw, Bowl, Bucket, Locomotive, and Splay. This book presents a whole-view look at the chart. Much of this book is filled with sample interpretations or delineations for each planetary pattern, planet, luminary, and aspect. The psychology of each planetary pattern, or Temperament Type, is presented as direct advice for chart delineation. The planetary pattern and other basic astrological influences of one hundred horoscopes are examined. The horoscopes were selected from books by Marc Edmund Jones, Dane Rudhyar, Robert Jansky, Michael Meyer, and Stephanie Clement, Ph.D. Ephemeris, birth information, and source references are included. High Focus Planets and astrological aspects are delineated. Spherical astrology, which is also known as three-dimensional astrology or true-body astrology, is explained and illustrated. This book presents a whole-view look at astrology’s seven fundamental planetary patterns: Splash, Bundle, Seesaw, Bowl, Bucket, Locomotive, and Splay. This is a quick and accurate method that puts a chart into perspective and gives an overall view of mental and emotional traits. Learn about someone's psychological profile just by identifying the chart’s fundamental pattern. Learn to read charts using this time-tested technique to interpret potentials and personality. The pattern orchestrates the planets. The planetary pattern affects behavior. Each planetary pattern is another path to success. To graphically illustrate the concept, one hundred charts are presented, each on their own page with the planetary pattern and other basic astrological influences, from Paula Abdul to William Yeats. Ephemeris, birth information, and reference sources for each example chart are included. Also included are a Glossary, Bibliography, and complete index. Easily find the High Focus, Leading, Cutting, Trailing, Trigger and Anchor Planets. Learn how the High Focus Planet shapes an individual and their approach to life. Spherical astrology, also known as true-body astrology or three-dimensional astrology, is explained and illustrated. The example horoscopes also have information about spherical aspects when they affect the chart. This book presents a new degree of precision in astrology! 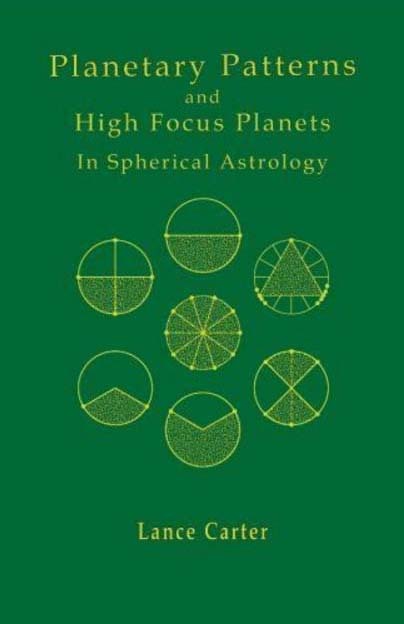 BUY "Planetary Patterns and High Focus Planets"